After missing the expected earnings and profits numbers, Google's shares are down 4% in after-hours trading. Apple's shares however are up by 1% in reverse sympathy. Google Android is beginning to look like a real contender for Apple's ubiquitous iPhone, so the companies are now regarded as serious rivals. Bad news for one parlays into good news for the other. With the options expiration tomorrow combined with the Google's earnings release, Apple's iPhone 4 antenna press conference, and BP's capping of the oil leak, the market should expect a busy and volatile day. 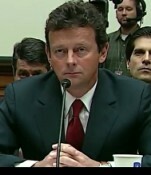 Is it just me or does the BP boss, Tony Hayward, has one of those faces you feel sorry for? I know, no compassion for BP, but watching the man squirm before the congressional hearing today, I almost felt bad for him. Ok, enough sympathy. Now let's get that Gulf gusher plugged, shall we? Just happened to see this ad on YouTube. Don't get it. I wasn't BP's friend before, why would I want to be their friend now? What's next, friending Bin Laden and Kim Jong-il? 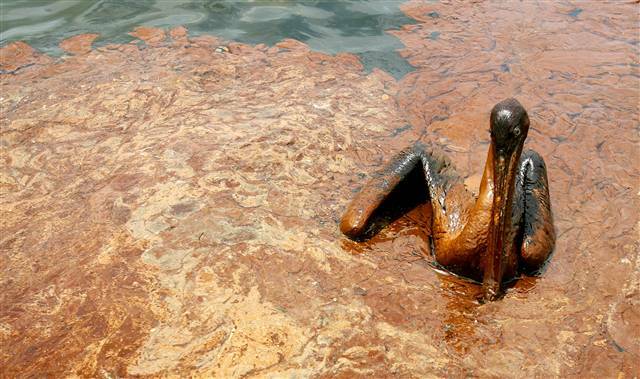 If MSNBC was trying to evoke feelings of sympathy and anger in its viewers today, it really came through with the picture of this defenseless bird covered in rust-colored BP crude oil. For me it sums up how reckless and callous oil companies are and how ridiculous the "drill baby drill" people sounded. You figure these people would want to pass on a clean world to their own kids, but no, the lure of money is just too strong to care about anything but their own pockets. And if they don't even care about their own children, how could we possibly expect them to care about the ruined lives of so many people facing tar balls on their shores, let alone this poor animal? 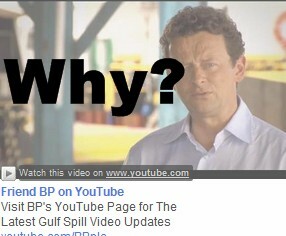 We can boycott BP for eternity but that doesn't solve anything. BP will continue to sell its oil or it'll just operate under another name, and we know the other oil companies are no better. A more appropriate response is to reduce energy consumption. Drive smaller cars, use public transportation, walk or bike when possible, turn off lights, combine errands, or use shorter wash cycles. There are so many ways to help save the planet and save money in the process. Try one on for size.